Authors: L. E. Bleem et al. As the name implies, galaxy clusters are gravitationally bound collections of up to thousands of galaxies. These clusters also contain copious amounts of intracluster gas, which exists as an extremely hot and diffuse plasma. The plasma is heated to extremely high temperatures through adiabatic compression (under its own gravity) and as a result emits X-rays through bremsstrahlung emission. This X-ray emission lends itself easily to searches for galaxy clusters. Galaxy clusters can also be found by looking for overdensities of galaxies in the optical or infrared. Even though one can search for galaxy clusters through their emission in various wavelengths, there is another approach of doing so using the Sunyaev-Zeldovich (S-Z) effect. The S-Z effect is an interaction between the hot plasma in a galaxy cluster and the photons from the cosmic microwave background (CMB). Basically, the high energy electrons from the ionized gas scatter the CMB photons and give them a slight energy boost. As a result, there is a measurable difference between these boosted photons and the original photons from the CMB. The CMB is known to have a nearly perfect thermal blackbody spectrum, whereas photons scattered from the S-Z effect show a spectrum that deviates from this. It is possible to take advantage of the S-Z effect and use these spectral distortions in the CMB across the sky to search for galaxy clusters. This method is unique in that it is independent of redshift, whereas traditional searches using optical/IR/X-ray are flux-limited (i.e. only clusters up to a certain distance/redshift can be detected before the emission becomes too weak). However, the S-Z distortion to the original CMB photon spectrum is very small (on the order of a few micro Kelvin, whereas the average CMB temperature is ~2.7K), so this signal is not always easy to find. The authors in this paper describe their results from searching for galaxy clusters using S-Z effect measurements from the South Pole Telescope (SPT). The initial search was based on existing optical and IR images of the sky, from which the authors identify overdensities of galaxies. The final result from searching 2500 square degrees of the sky using SPT yielded 677 galaxy cluster candidates, of which 516 were confirmed to be clusters with optical/IR follow-up imaging (for example, Fig. 1). Fig. 1: An example of one of the galaxy clusters discovered via the S-Z effect (optical image on left, infrared image on left). The contours represent the strength of the S-Z effect. The measurements were made of the sky in three different frequencies to pick out the unique CMB spectral signature induced by the S-Z effect. After being detected using this method, half of these cluster candidates were further confirmed using follow-up imaging. This was done using relatively small optical telescopes for low redshift clusters, while high redshift clusters were identified using data from Spitzer and WISE. 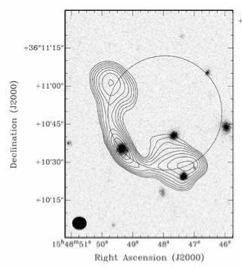 Even though the authors have successfully identified these clusters with the SZ effect and confirmed their observations with additional imaging, there still are a number of clusters in the survey that remain unconfirmed (i.e without corresponding optical/IR data). It is likely that these “missing” clusters are at a sufficiently high redshift such that they have not been detected using traditional methods, so deeper photometry is probably needed to find these. The abundances of galaxy clusters are highly sensitive to initial conditions in large scale structure formation, so the depth and coverage of this sample of clusters will be useful for testing cosmological models.